Not only is Danny O'Donnell the owner of Fun Imported Auto and Toys, he's also probably one of the biggest FIAT and Italian car nuts in America. Ask him how many cars he's owned in his short life and he'll respond "oh, a couple hundred." At Fun Imported Auto and Toys we feel it's important to not only be crazy for the cars we service, it's also important to own and drive them! So if you have any questions about the Italian car you're currently working on, email Danny, he probably not only knows how to fix it and can recommend the right parts, he probably can also tell you the story about how he did the same repair on one of the cars he's owned. Danny currently has about 24 cars filling his stables and you can see some of the choice few listed below. This is the car you're most likely to see Danny driving around the streets of Connecticut. His bright orange 1973 Fiat 124 Spider is probably one of the best stock 124s in the country.. It features only 39,000 original miles, and has the optional factory wheels. It's a very orignal car and nothing has been modified on it. This is another one of Danny's rare cream puffs. 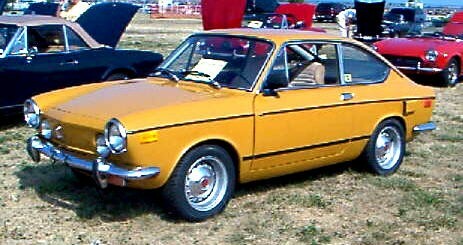 A 1969 Fiat 850 Sport Coupe in a lovely mustard yellow. It doesn't get out much but when it does, it's sure to turn heads. Mostly original paint, the interior is mint and original. Lurking under the rear deck lid is a fuel injectied 1438cc twin cam motor from a 124 spider. The suspension has been heavily modified with lots of Abarth upgrades. Now this is what you call a great birthday present. In 2001, Danny purchased this 1959 Abarth Allemano 750 spider for himself to celebrate his birthday.. It was at one time a street car but has been converted over to a vintage race car. In 2002 he brought it out for its first run on the historic Lime Rock Park circuit in Lime Rock, Connecticut. He's looking forward to running the car in 2003 in New Hampshire. The car is currently running a 767cc motor, but expect upgrades for 2003. To see pictures of the car in action in 2002, click here. 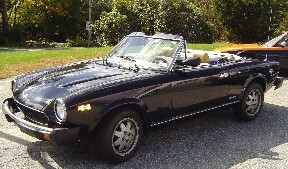 This 85 1/2 Pinninfarina Spider is one of Danny's favorite drivers. It has 97,000 miles and is stock except for the addition of his stainless steel exhaust system.